It was a really quick build, about 45 mins all in! Much easier with the IC, avoids all that nasty transistor biasing! Thanks again. I have a 10k log pot I was going to use in place of the 25k, which of the 1u capacitors should I replace for the 2u2? 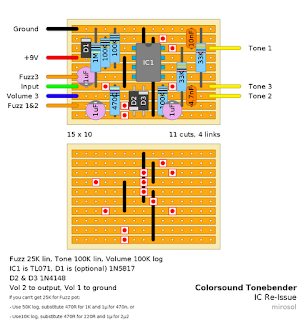 Also don't have a 100k lin for the tone, can I use a 50k and modify a resistor value elsewhere? Cheers! Not as powerful as I thought it would be. Also, the fuzz potonly starts to bring the gain at nearly all the way up. The tone kind of takes away volume. Any ideas? I actually took out D1 and placed a jumper in its spot which kind of fixed the issues I was having. I've seen that both the TL071 and TL072 have similar pinouts, although the 72 is a dual. Being a noob to electronics, how much of the layout would I have to change in order to use the 72? I'm having hard time believing that polarity protection diode will affect the sound enough to notice it. All Tonebenders are quieter than expected by default. You could try smaller pot for fuzz, like 10K. And you could try upping the 100K resistor in parallel to clipping diodes to get more gain. Buenas. Construí el mismo. Suena retro, me gusta, pero como dicen por ahí ..le falta ganancia. ¿Podría colocar un potenciómetro de 250K reemplazando la resistencia de 100k para obtener más ganacia y así poder regularla? Ya le cambié la resistencia de 100k pot un potenciómetro de 500 k. Tiene más ganacia, más fuzz. Pero noté que tocando despúes del traste 12 las notas se cortan. Is not a tonebender, far away from a germanium or even silicon MKII - III, but it sounds nice to my ears. More on overdrive than a fuzz, but sounds really fine for a so little circuit. Surely it will get boxed (1590A, of course). 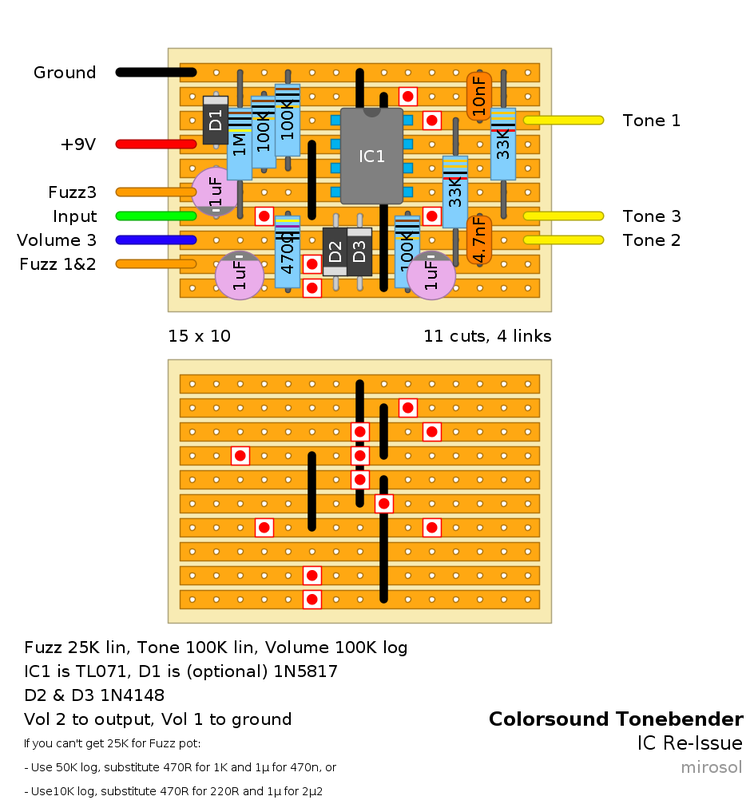 The only issue is that the fuzz knob has to be definetely antilog, even with a lin the fuzz is on the last 20% of the sweep.